This post has been updated with information from the Columbus County fire marshal. At 6:30 last night, the cafeteria at Acme-Delco Middle School in Columbus County was nearly empty. By 7, every chair was filled. 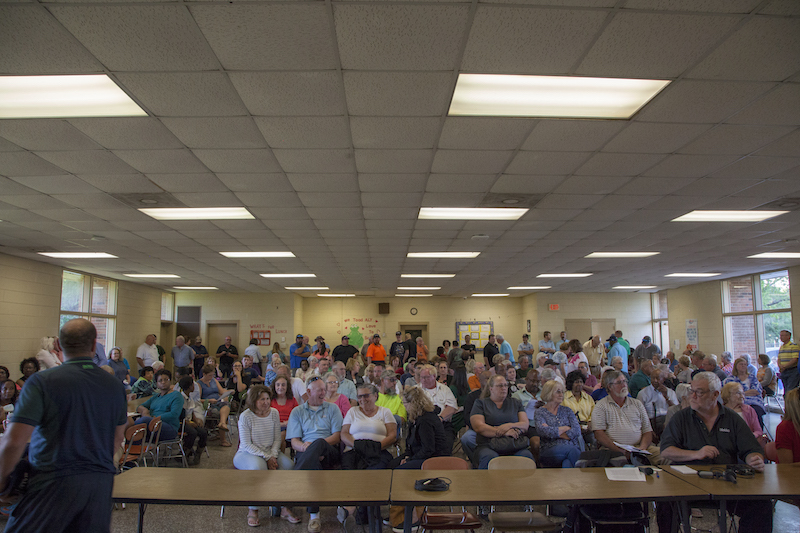 The crowd — young mothers, fathers, babies, children, men on canes, a woman on portable oxygen and another in a wheelchair, loggers, retired DuPont workers, veterans, scientists, preachers, doctors — they all kept streaming in until the room could hold no more. They had assembled to speak and listen at a state environmental hearing on proposed log fumigation facility, operated by Malec Brothers Transport of Australia, that would emit as much as 140 tons of highly toxic methyl bromide into the air each year. The logs, timbered by a Dutch company, would then be shipped to China. Methyl bromide has been banned or phased out in many countries for most uses because it depletes the ozone layer and harms human health. Health studies have shown that long-term, low-level exposure to methyl bromide can harm children’s neurological development and possibly can contribute to motor-neuron diseases, such as ALS, in adults. 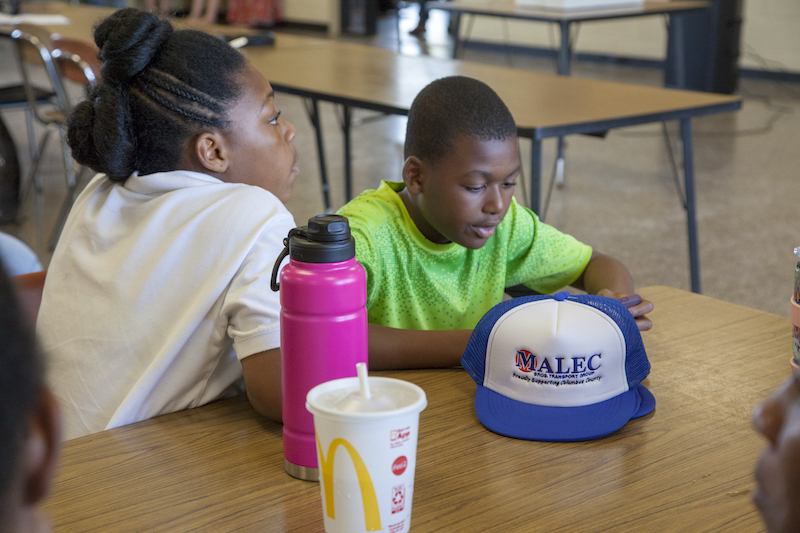 Malec Brothers Transport handed out free company caps. The hat reads “Proudly Supporting Columbus County”. Despite the proven risks, Malec Brothers would install no “control technology” — nothing to scrub the emissions. Instead it would rely on “operational controls” — venting the shipping containers where the logs are gassed via a 30-foot stack, which would allow the emissions to float away and elude the monitors along the property boundary. And if methyl bromide levels exceed 1 part per million near the containers, according to the air permit application, workers will use “sandbags and duct tape” to seal off the leak. The saga that unfolded over the next two and a half hours demonstrated that the Malec Brothers, at best, is tone deaf about the community that would bear the burden of its pollution. (No, not even free baseball caps appeased residents.) And at worst, the company views — inaccurately — Delco as a backwater of naive country folks who, once hypnotized by dollar bills, would offer roll over and offer little resistance. And in its mishandling of the meeting, the Department of Environmental Quality showed it had failed to adequately inform the public of what was at stake. Nor in the permit review had the Division of Air Quality done any modeling to test the veracity of the company’s claims. 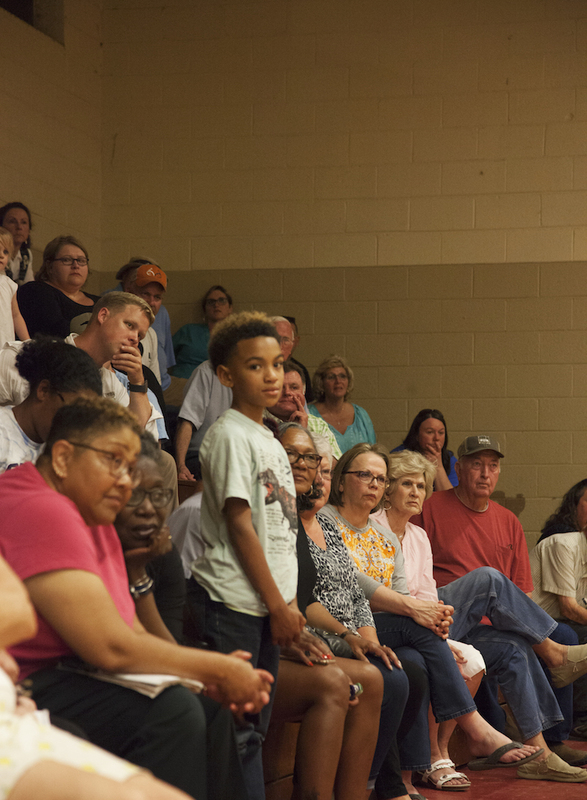 And DEQ had grossly underestimated community interest — midway through, the meeting was temporarily canceled by order of the fire marshal. Instead, the agency had engaged only in a box-ticking exercise of obscure public notices, and at the meeting, delivered a jargon-laden reading of indecipherable permit conditions. Malec Brothers Transport used a worker to try to calm the crowd, which was on edge. You’re in the wrong place, buddy. Next, Malec Brothers trotted out company’s director of procurement, David Smith, to try to reassure people that its log fumigation facility, which would emit as much as 140 tons of highly toxic methyl bromide into the air, would be safe. Crowd, now incensed, collectively groaned. A chorus of boos and jeers. Smith looked at the table of DEQ officials, his eyes filled with the fear of a cornered rabbit. He left the microphone before his allotted two minutes had expired. And finally, the company brought out a third worker, who was Black, to vouch for its benevolence. Before the crowd could finish booing, the fire marshal, stationed nearly 30 miles away in Whiteville, shut it down. More than 300 people were in room that had a legal capacity of 192. “We’re canceling the meeting and will reschedule it,” announced DEQ Communications Director Megan Thorpe. Two sheriff’s deputies stepped forward. Updated information: Acme-Delco Middle School Principal Kevin Toman later told me that the fire marshal’s office — 30 miles away in Whiteville — called him and told him he had to clear the room. Fire Marshal Shannon Blackman told Policy Watch Friday afternoon that he received “several calls,” one of them from the school’s head of maintenance. 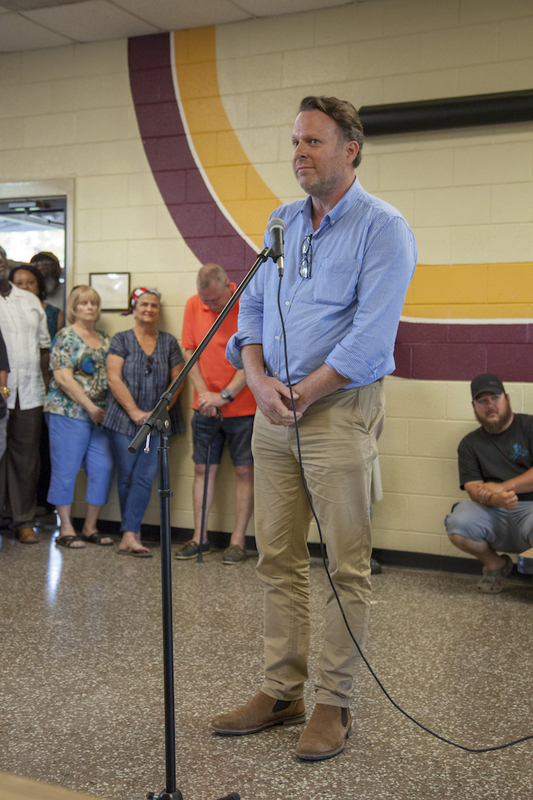 As the cafeteria cleared, DEQ then reversed course and resumed the meeting in the gym, where the principal and other school officials fired up industrial-size floor fans to clear the stuffiness. In the gym, home of the Acme-Delco Trojans, area residents, many of them who work in the chemical and logging industries, continued to assail the plan. After the fire marshal shut down the meeting in the cafeteria, it resumed in the gym. 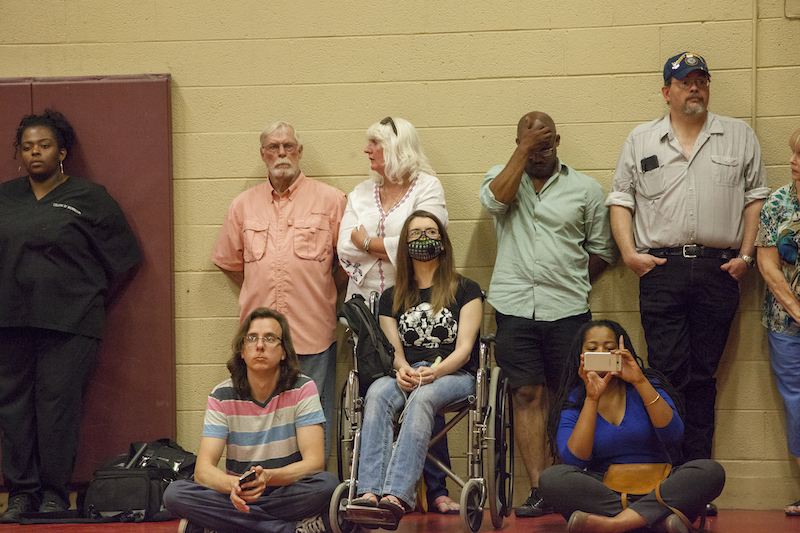 Candace Harrell, pictured in the wheelchair, has an immune disorder and other health problems that require her to wear a protective mask in public. To her left is friend Nickolas Phillips. To her right, Ashley Niquetta Daniels, who raised community awareness of the issue through her church and Faecbook. Tom Boler works at Hexion, a chemical plant just north of the facility and near the former Wright Chemical site, where contamination landed it on the federal Superfund list. “The state hasn’t run a model. So I ran one.” Within two miles away, Boler said, people would be exposed a levels above 1 part per million. If the wind blows the right way, “this school” — a mile away — could be exposed at 5 parts per million. Levels that high at the facility would require workers to put on protective gear. Delco area residents listen to the speakers at the DEQ hearing. In the pink shirt in the foreground, Veronica Carter is on the DEQ Secretary’s Environmental Justice and Equity Advisory Board. The company has said it relocated from Wilmington to Delco to be closer to the timber. But public outcry in Wilmington shut down a similar facility operated by a competitor of Malec Brothers. Delco is rural, low-income and 50 percent communities of color. Your account of the meeting is excellent. My wife is a recent transplant patient, what risks does ethyl bromide present for those who are immunosuppressed? Great info! Thank you so who spoke to protect families from this.